Toyota’s 2014 LMP-1 to Use V8 Engine? 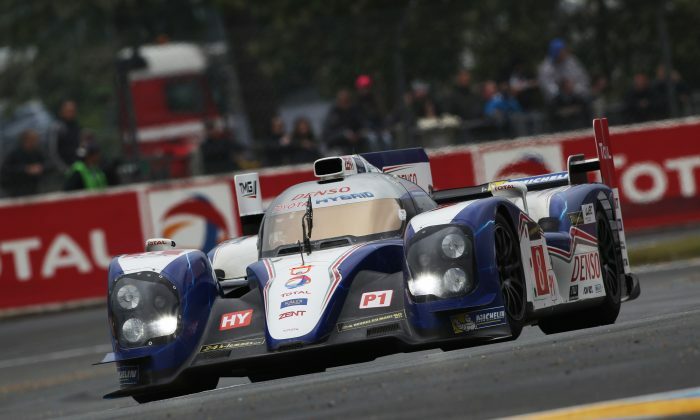 An article published on the German website Motorsport-Total.com claims Toyota’s 2014 LMP-1 car will use the same gasoline-fueled3.4-liter V8 and superconductor hybrid system which powers the current car, augmented by a second hybrid system driving the front wheels. The article says the engine will be “extensively revised” to reflect the fuel-efficiency requirements of the new regulations. The 2014 regulations for the LMP1 class are based around fuel use, not air restriction or displacement limits—cars can use either gasoline or diesel, in a variety of configurations and displacements, turbocharged or normally aspirated, but can only use a certain amount of fuel per lap. Most racing pundits believe the plan, designed both to allow manufacturers greater freedom in design while also making racing more environmentally friendly (at least for PR purposes) will lead either to very mall turbocharged engines or fairly large V8s running at low revs while producing a lot of torque. The small turbocharged motors would use less fuel because of their smaller displacements, and generate a lot of power because of the boost. The V8s would use less fuel because they would be doing most of the work at low revs—each cylinder might be sucking up twice as much fuel as the smaller boosted engine, but doing so half as often. The article from Motorsports-Total is rumored to come from a source in Toyota Motorsports GmbH, the German company which builds Toyota’s endurance racers. It seems Toyota thinks its 3.4-Liter V8 can be run efficiently enough, and that the chassis can carry two hybrid systems without being uncompetitively heavy. This would give the 2014 Toyota the benefit of all-wheel-drive coming off the corners, so if the engine is tuned for torque and low RPM, one would wonder how the tires would fare. Possibly Toyota thinks there is some why to reach sufficient top speed (high horsepower at high revs) without using too much fuel? One would think an exotic engine-management system to closely control when and how much fuel is injected might be in development, or perhaps even one that shuts down cylinders under braking? Apparently the new regulations are successfully promoting the variety and innovation they were designed to foster. The 90th running of the Le Mans 24 starts a 3 p.m. local time on Saturday, June 22. In the United States, follow the race on Speed-TV and Speed.com.